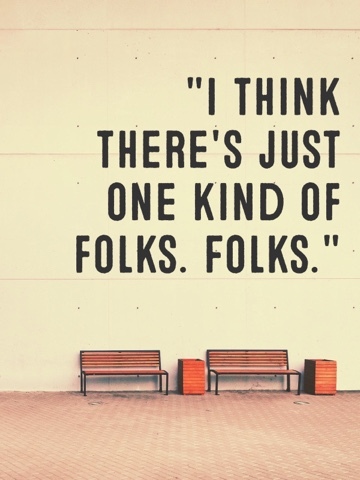 I think this quote sums up Harper Lee's works in their entirety. We are all people. We all matter. We are all different, but we all deserve to be treated equally. Harper Lee passed away today--February 19th, 2016--at the age of 89. As most of us know, Ms. Lee was the author of the classic book To Kill A Mockingbird which was published in 1960 during a time of civil turmoil in our country. To Kill A Mockingbird was Harper Lee's crowning achievement and one of only two books that she published in her lifetime. The main character Scout is loosely based on Ms. Lee's own childhood and is a condemnation of racism in the south. Ms. Lee's voice was immeasurably important in opening up talks of race, justice, and fairness that still reverberate today. Not only was Harper Lee an important voice, but she really didn't want the fame or fortune. She donated loads of her money to charities and really wanted to live a quiet life. Please join us in celebrating the life of this incredible woman, Ms. Harper Lee. "You never understand a person until you consider things from his point of view...until you climb into his skin and walk around in it."